Additional research provided by Robin Conley and Cecelia Moore. See also: African American Dance Ensemble; American Dance Festival; Buck Dancing; Clogging; Shag Dancing; Square Dancing; Step Dancing. Dance as a religious ritual, community pastime, and performing art has existed throughout North Carolina history. From the ritual dances of the region's Native Americans, particularly the Cherokee, to the shag dancing popular in beach parties of the 1950s, the state's residents adapted their various ethnic dance traditions and added movements and variations to develop new styles. Some of these dance forms, handed down through generations of families, are familiar features of dance festivals and organizations. Such forms as buck dancing, clogging, square dancing, and step dancing all reflect the state's Native American, European, and African heritage. Dance as a performing art is widely supported by North Carolinians as well, and the state is home to numerous ballet, modern, jazz, and ethnic dance companies and to organizations dedicated to preserving traditional dance forms. In the twentieth century, some North Carolinians initiated efforts to preserve and revive indigenous dance as part of preserving a group's culture and heritage. An interest in Appalachian mountain culture in the 1920s and 1930s inspired folklife festivals and dance groups to preserve and present indigenous square dancing, clogging, and other variations on traditional mountain dances. 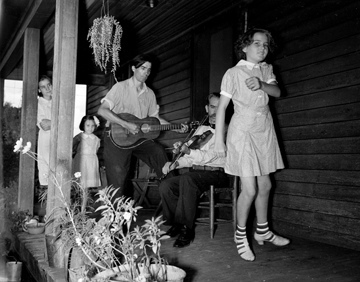 Similarly, the Eastern Band of Cherokee Indians and other North Carolina Native American tribes have worked to revive their dance heritage at different times, drawing on memory and anthropologists' records to document and preserve the dances that were once part of religious ceremonies and community celebrations. Organized ballet companies in North Carolina date to 1959, when the Area Ballet Company formed in Raleigh. The founding of the dance program at the North Carolina School of the Arts (NCSA) in 1965 encouraged more groups to organize. The North Carolina Dance Theatre (NCDT) was created in 1970 as a professional affiliate to the NCSA by Robert Lindgren with a grant from the Rockefeller Foundation. Lindgren, a former leading dancer with the Ballet Russe de Monte Carlo and the New York City Ballet, had extensive touring experience before beginning a teaching career. In 1965 he was appointed dean of the School of Dance at NCSA, a position he held at the time of the creation of the North Carolina Dance Theatre. The NCDT moved from Winston-Salem to Charlotte in 1992 and is housed in the Blumenthal Center for Performing Arts. DancePlace, the official school for the NCDT, offers classes in various dance techniques to students of all ages and interests, summer intensives, and the opportunity for students to audition for NCDT's annual production of The Nutcracker. In 1997 North Carolina established a new "state" ballet company, which was named the Carolina Ballet. Located in Raleigh, the Carolina Ballet is a professional company that emerged from the vision of Ward Purrington, a Raleigh lawyer, and the work of Ann Vorus, who founded the Raleigh Dance Theatre in 1985. That company became the Carolina Ballet Theatre, and Purrington approached Vorus and Mary LeGere, artistic director since 1994, about taking the company to professional status. Both declined the offer, preferring to concentrate on the Raleigh School of Ballet, and Purrington became board chairman of the Carolina Ballet. Following an extensive search, Robert Weiss was hired as artistic director of the Carolina Ballet. A former principal dancer with the New York City Ballet, Weiss also brought eight years of experience and success as artistic director of the Pennsylvania Ballet. The Carolina Ballet's inaugural season began in October 1998 at Raleigh's Memorial Auditorium with an all-Balanchine program. Led by Weiss, the Carolina Ballet has surged forward in its goal to be a nationally recognized company. The company has attracted quality dancers and choreographers from across the nation. Performing both traditional ballets and original works by Weiss and local choreographers, the Carolina Ballet's quality and innovation have attracted much attention to North Carolina's ballet community. Other dance companies, focusing on ballet, modern, and other forms, thrive in the state. The Area Ballet Company settled at East Carolina University in 1965, becoming a resident company for that school's dance program. Since 1984 Durham's African American Dance Ensemble has performed high-quality African and American dance for both local and international audiences. The North Carolina Dance Alliance (NCDA) was established in 1982 with assistance from the North Carolina Arts Council. It is a nonprofit service organization that supports dance activity in North Carolina, provides a statewide network of communication within the dance community, and acts as an advocate for dance in North Carolina. The NCDA represents individuals and organizations who are involved in all areas of dance, including choreography and performance, dance therapy, administration, dance education, dance patronage, and modern, ballet, jazz, tap, folk, ethnic, social, and theatrical dance forms. Mike Seeger and Ruth Pershing, Talking Feet: Buck, Flatfoot, and Tap: Solo Southern Dance of the Appalachian, Piedmont, and Blue Ridge Mountain Regions (1992). Susan Eike Spalding and Jane Harris Woodside, eds., Communities in Motion: Dance, Community and Tradition in America's Southeast and Beyond (1995). Frank G. Speck and Leonard Broom, Cherokee Dance and Drama. Asheville Mountain Music Festival Asheville August 1938, photo taken by Baker. The musicians are Osey and Ernest Helton. Conservation and Development Department, Travel and Tourism Division Photo Files, North Carolina State Archives, call #: ConDev1424C. Available from http://www.flickr.com/photos/north-carolina-state-archives/2387463997/ (accessed November 1, 2012). 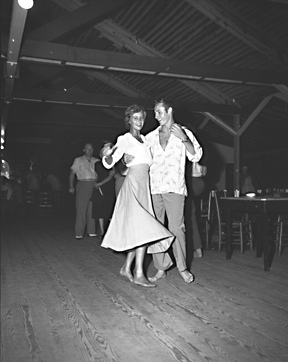 Couple dancing or shagging, Nags Head, NC, 1948. From Conservation and Development Department, Travel and Tourism Division Photo Files, North Carolina State Archives, call #: ConDev7202B. Available from http://www.flickr.com/photos/north-carolina-state-archives/2431088783/ (accessed November 1, 2012). "Apollo - Traci Gilchrest & David Ingram". Image courtesy of NC Dance Theater. Available from http://www.flickr.com/photos/44066499@N08/4598386221/ (accessed November 1, 2012). 1 January 2006 | Conley, Robin; Koos, Emily; Moore, Cecelia; Pertalion, Patricia L.